I really expected to be less than thrilled by this novel and even contemplated skipping it altogether. After all, I’m not the biggest Scott/Crowe fan (I hated Gladiator, yup I said it and I feel better), and I’m not in the least bit excited for the movie so why bother with a book about the CIA and foreign operations and other political conspiracies that I have no room for in my brain this election year? But I picked it up anyway, just to read a few chapters and see if I could stick with it and it turned out that I could. Before I knew it, I was up until the wee hours of the morning, flipping through and wanting to know what happened next. 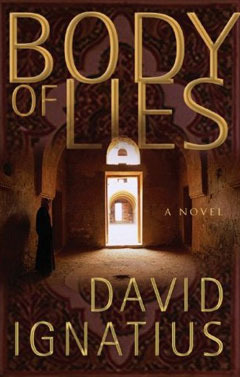 The book follows Roger Ferris, a CIA agent who is wounded in Iraq and relocated to Jordan where he begins to track an Al Queda member known as Suleiman who is setting off car bombs throughout Europe. With his boss in D.C., Ed Hoffman, he devises a ruse that intends to get them inside of Suleiman’s network. I’m about as politically ignorant as you can get and thought I’d have trouble swallowing all the details and understanding the nuances of the CIA plot, but it has completely sucked me in and I’m dying to know where it will take me. I’m just a few chapters away from the end and I can tell that this book has not finished twisting and turning. To be honest, I spent a good portion of the book thinking that Roger Ferris was Russel Crowe’s character. It was only after realizing that there was no one else DiCaprio could be that I figured they must have beefed up Hoffman’s character for Crowe. I’m anxious to see how they’ll change the part of Ferris to adapt to DiCaprio, considering in the book he is described as someone who can pass for Egyptian and his heritage plays a big part in the plot. Also, there is a very strong American woman in this book that would have been a great role for a subdued actress such as Gwyneth Paltrow or Charlize Theron, but appears to have been changed considerably as an Iranian actress is portraying the role in the film. I find that to be a bit shocking given the importance of Alice (in the film she’s now Aisha), and makes me wonder what else has been changed and if the movie will have the same twists and turns that I’m loving so much in the novel.